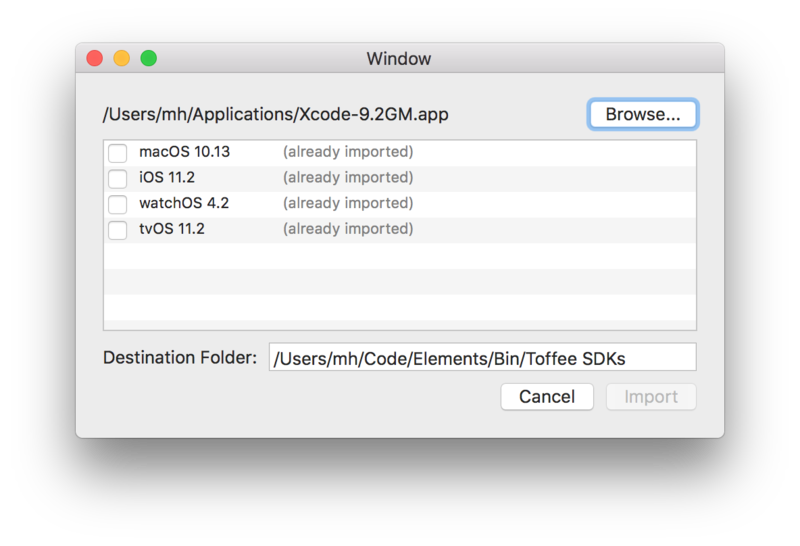 Elements already ships with .fx files for the latest macOS, iOS, tvOS and watchOS SDKs, when working in Cocoa or Island/Darwin projects. Usually, imports for new versions of Xcode, including betas, are made available within a day or two at elementscompiler.com/elements/sdks, so you will rarely have the need to import SDKs yourself. That said, FXGen integrated into Fire makes it possible to use beta SDKs we haven't added support for yet, or to manually re-import an existing SDK (e.g. older) SDK, should the need arise. Fire will already pre-select the currently active Xcode version (if configured), but you can select a different (e.g. older) version of Xcode.app via the "Browse" button at the top. In the table view below, FXGen shows all the SDKs found in Xcode, and it will check the ones that Fire does not already have .fx files for by default. You can also optionally check SDKs marked as "(already imported)", if you want to to re-import them anyway. Finally, you can specify compiler mode to import for, Cocoa or Island/Darwin, as well as the destination folder where FXGen should put the finished .fx files, at the bottom. Depending on the size and scope of the SDKs, this can take several mintes or longer; you can close the FXGen sheet and continue working, om the mean time. The SDKs generate a lot of .fx files, for some platforms in up to five different architectures. iOS for example generates armv7, armv7s and arm64 versions for the device, which will then be merged to a Universal .fx, and i386 and x64 version for the Simulator, which also will be merged. macOS generates only one architecture, but has well over 100 different framework files, from Accelerate.fx to WebKit.fx, and each new version adds more.